← Journey to the Red Sea – part three; into Jordan! I have been fixed and serviced numerous laptops whilst volunteering for a charity here in Israel. Here I am going to show you how to replace a DVD drive on a laptop that has this unit ‘fixed’ By that I mean on business laptops like IBM’s Thinkpad series, most Dell Latitudes & some Inspirons, Compaq Evos the drive can be removed and replaced with a simple lever that unlocks the drive so it can be slid out without any tools, and without even turning off the computer, you can unmount the drive on the Windows task bar. 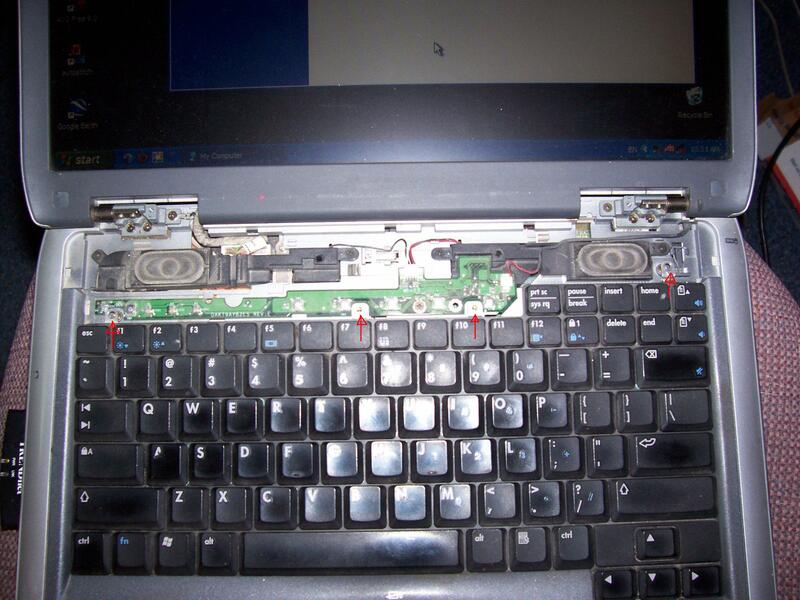 On these laptops that have the drives fixed often on Toshibas and Sony Vaios, these can be replaced be requires the computer to be dismantled more fully, if that sounds scary, actually this can be done often without a problem if you go slowly and take care. One was a Lenovo 3000 that belonged to a friend which upon finding that the main board was defective was not economical to fix. One of the usable parts that I salvaged was the DVD writer. 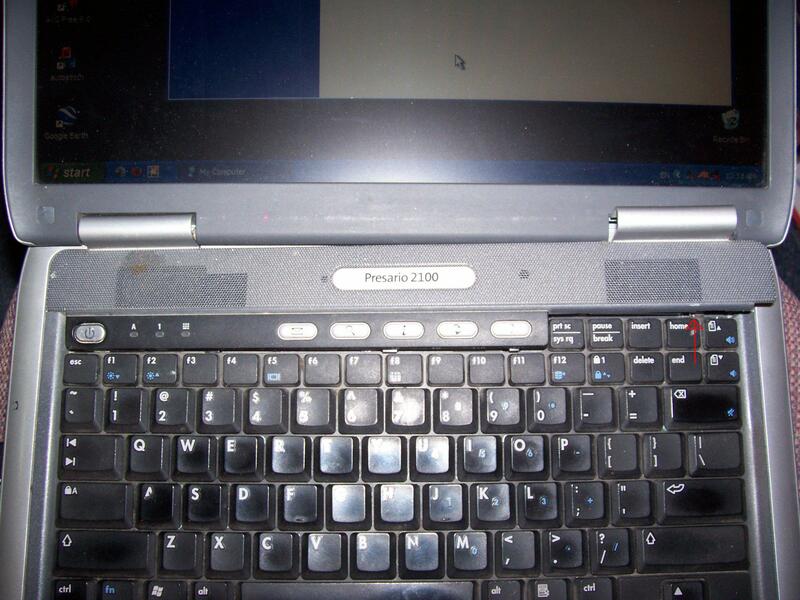 The hard disk was also faulty so the LCD screen and the keyboard will be listed on ebay at some point. On this Compaq Presario 2100 its a little more involved. This laptop is much different from other Compaqs I have seen as the layout of the insides is quite different. It has an AMD Athlon 2800 processor, doesn’t have a built in wireless card so uses a slot in PC card one (signal strength is poor as it doesn’t have a proper antennae) and the battery has not surprisingly aged and will only run for 30 minutes. However after a reinstall of Windows and regular drivers and fresh version of the owner’s apps it runs very well, its not hugely quick as it has 512Mb of memory. First of all these two computers actually have standard type laptop DVD drives. You can get this style part from a specialist mail order computer dealer or look around for a new or used one off ebay. What can make things difficult is the plastic fascia panel of the drive may be a different colour or a totally different shape from the standard, often these panels can be changed over they can be gently prised off and swapped over, as long as its exactly the same make (often LG, Samsung, NEC, Sony etc) and model drive. This can save you money as long you make sure you choose exactly the right drive. First of all, work somewhere with enough space and near something earthed like a radiator to earth yourself from any static that can damage electronic products. 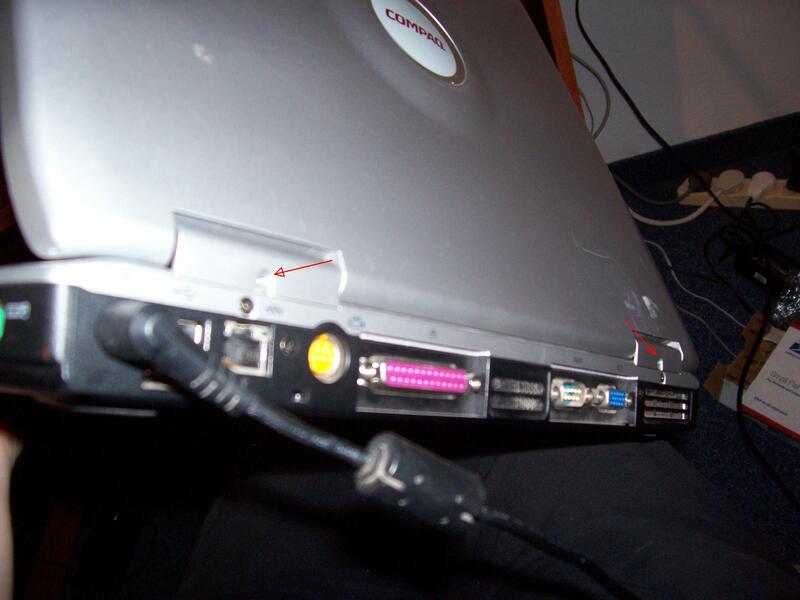 Make sure the computer is turned off and the AC adapter is disconnected and the battery is removed. I would suggest you tape the screws onto a piece of paper with a diagram of where they go in, you don’t want to lose them or put big ones in where only little screws go in as this can cause damage. Get a decent small screwdriver set, I went though several sets of the cheap ones, they were total rubbish the handles would break off or the tips were just get mashed up and were not suitable for getting out little tiny screws. I got a good set from the motor retailer Halfords for about £7.99 about two years ago. Turn your Compaq Presario upside down and remove the screws at the back that hold the silver panel which is above the keyboard, sorry I missed out making a picture for this step. There are two more screws behind the computer where the panel covers the screen hinges go, don’t forget these. Tilt the scree fully back and this panel can be removed easily. 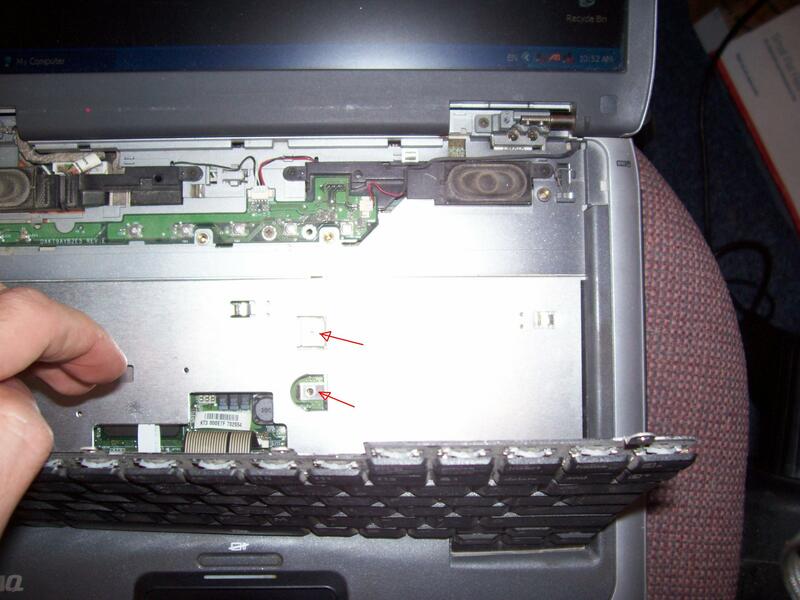 On a Dell Latitude or Inspiron, this panel can removed easily without taking out any screws it just prises out. Actually the little silver power button was a bit wonky as it was a bit broken previously, (not by me taking the machine apart!) so I glued it gently back in place, and now its all fine. You need a largish thin bladed screwdriver to start easing off the panel on the far right in between the top row of keys by the break and scroll lock keys and prise it upwards, work your way leftwards, and eventually this panel should come free. Next there are four screws holding the keyboard down, remove all of these, note, the right hand one is a different size from the other three. Inside in the middle is two screws, these different sized ones can be removed. The drive can now be removed, slide it out. 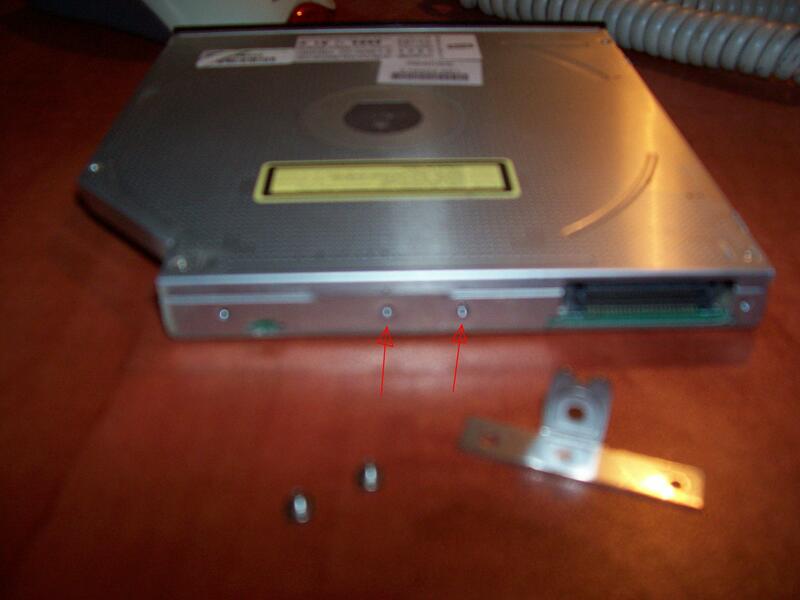 Here is the drive from the Lenovo unit, you can see this little bracket will need to be removed, the original broken (which was a ‘combo’ unit read only DVD, read and writes CDs) drive from the Compaq has different metal bracket from the one from the Lenovo. There are two screws that you can remove to take off this little bracket and swap it over to the replacement drive. The replacement drive be fitted back in its place. As I mentioned, the plastic front panels can be a different shape, some could be curved or sloped which can be awkward to find a replacement, this drive is slightly wrong, the front panel of the replacement drive sticks out by about 1-1.5mm, but it works perfect and should not be a problem. Jonathan has spent the last five years keeping professionals in vehicle contract hire, healthcare, software development and Christian ministry keep working on the move. As he seeks to look at carrying on donating his time in looking after the IT backbone of a charity in Jerusalem, he is seeking means to get new sponsorship, therefore if you have a question for him on laptop maintenance/repair, even to initially check if its viable feel to comment below. He would appreciate some kind of gift towards his next challenges coming up in 2010.